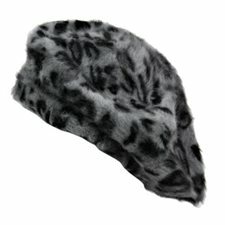 Fall in love all over again with the feel of this luxurious hat. The body of the cap is printed in animal style. Ultra soft and loose feeling. Classic in style, timeless fashion accessory. Hat has up to a 25 inch circumference. There is no brim on the hat. Hat crown is 4 inches high.